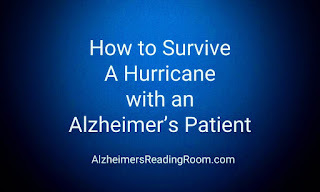 Six of my most important tips for dealing with an Alzheimer's patient during a hurricane. I took care of my mom, Dotty, for eight and a half years, 3,112 days. My mom lived with Alzheimer's disease. We survived 2 hurricanes together including monster hurricane Wilma. A category 3 hurricane when it reached our home in Delray Beach, Florida. Here are 6 of my most important tips for dealing with an Alzheimer's patient during a hurricane. My mom acted downright "nutty" during the hurricane. She did exactly the opposite of what you or I would do during a hurricane. I had problems getting her to stay in a safe place. She constantly wandered over to the windows to see what was going on. The noise from the hurricane sounded like a truck roaring by while you are standing on a corner. It was loud. My mother couldn't figure out what was going on, and she kept asking what is going on. Let me make my first point. It's not their fault. It was not my mom's fault because she really couldn't understand what was going on, and the danger we were in. Here's the deal. More likely than not you are going to get upset with your loved one living with Alzheimer's when they start doing the wrong thing. This is how your brain works - someone does something wrong and you try and correct them, you ask them to stop, and then you start yelling and criticizing them. You have to help yourself, you have to help yourself to operate effectively as a caregiver. You have to remind yourself over and over and over - It's not her fault. You have to work with your own brain to succeed. You have to deal with the behaviors that come to all of us as we live in Alzheimer's World. The tendency is to try and explain over and over what is going on, and to try to tell you loved one how dangerous it is outside. Don't bother, it won't work. You can say it over and over but guess what - they won't remember what you said a couple of minutes ago. They won't remember. If you try and engage in this behavior - explaining - you will accomplish one thing - you will hurt yourself. Your level of frustration will rise, you level of stress will rise, and sooner or later the anger will set it. Is that what you want? To make things worse? Or, do you want to survive intact? Mentally intact. Remember - no more blah blah blah. You have two big weapons at your disposal - your smile and your hand. When you want to move your loved one back to a safe place, or get them to cooperate in any way start with the smile. Try to relax to the degree possible. The smile will help you do this. Be kind, be understanding. After smiling stick out you hand - palm up. Wait for your love one to take it. Do not explain when they ask, what are we doing, where are we going. Wait for them to take you hand and guide them. Do not say more than 3 words - "follow me" is more than enough. Smile, palm of you hand, you have everything you need. Use these 2 tools. Always be kinder than you feel. Yep, this works. Doing the exact opposite of what your brain will tell you to do in this situation. Let me describe myself before the Hurricane - I wanted to be a "macho man". Protect our Kingdom (our home), and protect my mom. Who could do this better than me? No one in my opinion. I decided to go it alone with my mom. After the fact I realized that yes I was a "macho man", and yes I was an "idiot and a fool". Why did I think going it alone made me a better man and a better caregiver? What should I have done? One of two things. I should have taken in a couple of people to stay with us. A few elderly people that were alone and scared. We could have ridden out the storm together. Now that would have made me a "macho man". Better yet, I should have gone to the house of one of my friends who was like the third little pig. The kind of house that would keep the big bad wolf at bay (I'll huff and I'll puff and I'll blow your house down). The Hurricane is the Big Bad Wolf. Believe it or not I could have done this. I didn't why not? Because I am a macho man - and idiot and a fool. We all need support - we know that don't we? Why didn't I get myself into a hurricane support group? Why didn't I form my own hurricane support group? You know the answer already. If you can get with a group of people here is the big benefit. You will have someone to talk with your loved one and keep them occupied. This way they might stay in one place - the safest place. Caregivers often feel abandoned and alone. I am a member of the club. In this case, I abused myself and my mom. I decided we would go it alone. Why didn't I help others? Why didn't I help myself? Learn More - Are Alzheimer's Caregivers the Forgotten? Believe it or not, there are hurricane shelters that are equipped to deal with dementia patients. I also learned recently that many of these shelters also have dementia professionals and volunteers that are already use to dealing this dementia patients. If you don't know what to do - the first thing I would do is call a place that specializes in adult day services for Alzheimer's and dementia patients (this is also sometimes called adult day care). One thing I learned from speaking to caregivers at adult day services is that the folks that run these places are often x nurses, experienced in geriatric care, or just kind hearted folks. They already know what to do and they can help you. Keep in mind, they are already helping caregivers that don't know what to do when a hurricane (or natural disaster strikes). I learned a long time ago - when possible go to the "knowledge". Go find someone that has the same problem and already knows the solution. If you are scared go ride it out in shelter. Nothing beats a hug during times of great stress. Nothings beats holding hands during a time of stress. We are all human and nothing beats feeling the touch of another person during times of stress. You can also pray for the best possible outcome for you, your neighbors, and friends. It can't hurt. Hurricane Irma is heading right at my home as I write this. If you are reading or listening to the podcast please pray for us. If you are listening or reading after the fact - you know what happened. This will be my fifth hurricane since I moved to south Florida in 2003. I'm anxious and nervous. There is some good news though. I am going to take care of a couple elderly people who are were good friends and very kind to my mom. I'm humble now - no longer a macho man. The Three Little Pigs is a fable about three anthropomorphic pigs who build three houses of different materials. A big bad wolf blows down the first two pigs' houses, made of straw and sticks respectively, but is unable to destroy the third pig's house, made of bricks. Hurricane Wilma was one of the most intense tropical hurricanes ever recorded in the Atlantic basin, as well as, in the western hemisphere.